A tutorial teaching you how to make a simple, extremely low cost, uncrashable fully customized shopping site ideal for selling a few items. Not happy with the shopping cart solutions available because they are too inflexible? Worry that if your product goes viral the server costs would be astronomical? Paying for a shopping cart service on top of your processing fees? 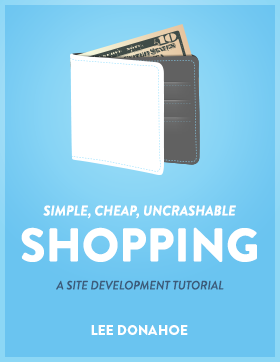 Check out this simple guide to creating an unsinkable and flexible shopping application. Follow the book below to get updates as the book is finished or visit simplecheapuncrashable.com to sign up for the mailing list. 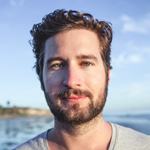 I’m Lee Donahoe, a front-end developer living in Venice, CA. I’ve worked on a number of projects for large companies like Salesforce subsidiary Heroku, Lowes Home Improvement, and the CDC, as well as initial technology builds for small startups like Tandem Stock, Mindswarms, and Buck Mason under my consulting company LEMUR Heavy Industries. Recently I’ve also been a founder of Tandem Vault, Coveralls.io, and Softcover.io, all software as a service applications targeting a range of industries. What’s this tutorial all about?